Aside from seeing a first look at Vin Diesel and Katee Sackhoff in the anticipated sci-fi sequel Riddick, the official hype machine hasn't really kicked off for the film just yet. However, the MPAA did recently give it the R-rating that everyone was hoping for, so a theatrical release will likely happen in 2013. In the meantime, director David Twohy is hard at work finalizing visual effects and sound mixing for the sequel, and every now and then he has a good update for his blog. 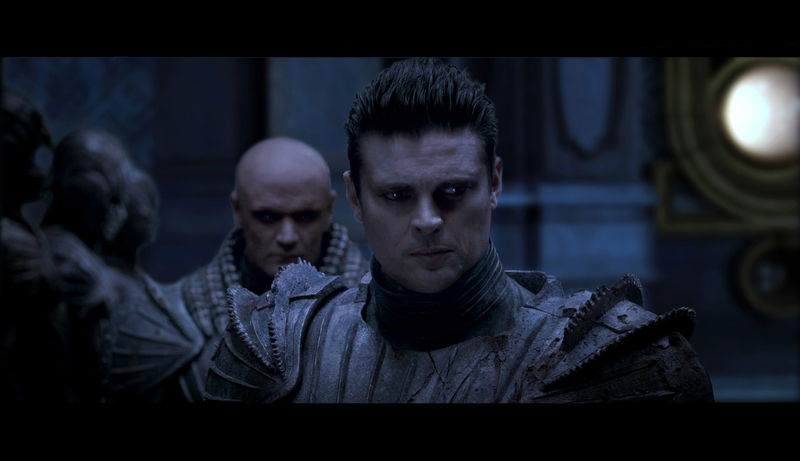 Well, now we have a brand new first look photo featuring Karl Urban reprising his role as Vaako, and he's not even wearing a helmet. See the photo below! Pitch Black and Chronicles of Riddick director David Twohy returns to write and direct the sequel Riddick starring Vin Diesel. Betrayed by his own kind and left for dead on a desolate planet, Riddick fights for survival against alien predators and becomes more powerful and dangerous than ever before. Soon bounty hunters from throughout the galaxy descend on Riddick only to find themselves pawns in his greater scheme for revenge. With his enemies right where he wants them, Riddick unleashes a vicious attack of vengeance before returning to his home planet of Furya to save it from destruction. Universal has not set a release date yet, but we expect it sometime in 2013. Stay tuned for more updates on this anticipated sequel. Cool? did you even follow your links? It's a wordpress blog, and it's a photo from july, what a first look. because noticing an error is such a hipster thing? It even got fixed in the post, i guess the author is a hipster too then. Yes, mistaking the WordPress blog for a Tumblr was my bad. It has clearly shaken the foundation of this story to the core. Otherwise, this blog from David Twohy was just recently noticed by a wider audience, and this photo hasn't been spread around much at all. That's why we're just now posting about it. i had never seen this photo before anywhere and I feel like I following this news more than most, and who cares if it's a wordpress or tumblr you hipster. I hope Urban rocks the white trash mullet again! Dredd was a brilliant film, too bad the Yanks didn't ' get it'. Dredd was brilliant, I saw it 3 times in theaters here in the US. Right cause it was a such a deep existential examination of a film...seriously why do you euros always gotta bring nationality into the mix? The marketing for the movie was awful, thats why the film failed. Not to mention most Brits don't seem to know proper grammar for their own damn language. lol - wtf does Dredd even have to do with this? Dredd was a great film! I only wish it did better. It deserved to do better. We've waited long enough for this to finally come to fruition. I am very excited. wow! he looks exactly the same!